The battle of Donetsk Airport in the Ukrainian Conflict has turned into a blow-out of multimedia storytelling. 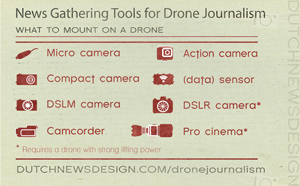 A crucial auxiliary tool is the news drone. The war reporter today needs a drone is his kit. In the Ukrainian Conflict news drones even became a crucial storytelling tool. Especially at Donetsk Airport, battleground since the start of the conflict3. On 19 January 2015 both the Russian-backed rebels and the Ukraine claimed control over the airport4. Just two days earlier, on 16 January, Army SOS, a fundraising collective for the Ukrainian army, posted drone footage of the devastated airport on Youtube5. Vice6 and Mashable7 reposted it on the same day, after which the video went viral. 18 January BBC News recorded its own (less wobbly) drone footage of the zone8. BBC used the footage to supplement a feature article, explaining the conflict, the devastation and the symbolic and strategic importance of the airport9. Then 19 January the Professional Society of Drone Journalists (PSDJ) used the drone footage of Army SOS to map the area and compared the images to publicly available satellite images, creating ‘dramatic photomaps that captured the landscape at a pivotal moment in history’, according to Matthew Schroyer of the PSDJ10. The images were then used to create a low-resolution 3D model of the airport. The models are already widely shared on the internet. According to the founder of the Drone Journalism Lab in Nebraska, Matthew Waite11, 3D models will eventually allow the audience to walk through an area where a news event had taken place, opening new possibilities for accurate reporting. Why didn’t the BBC use the same footage as everyone else? The drone footage of Army SOS was very detailed. So why didn’t the BBC just use that? Simple. Credibility. Army SOS is an organisation supporting the Ukrainian army. Their video is accompanied by heroic music, suggesting it might even serve as propaganda, to raise money for the army. Both Vice and Mashable do mention this agenda, but only the BBC decides to send their own reporter. Eyewitness accounts are essential for journalists to ensure credibility 12. 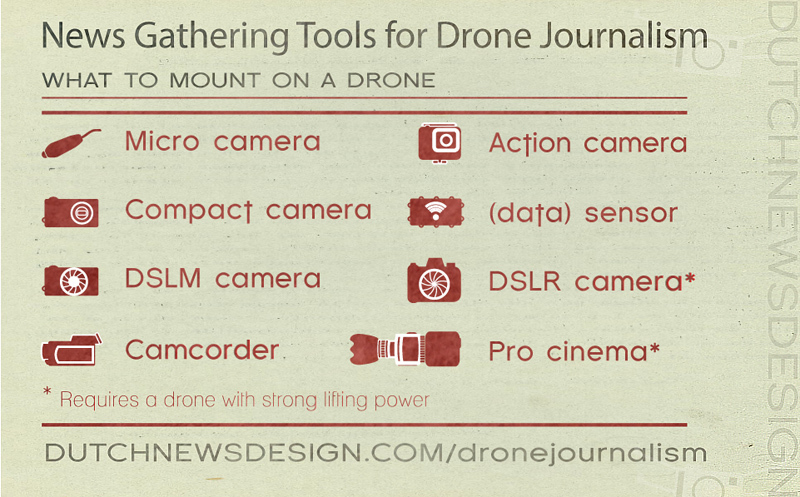 And drone methods of data gathering do ‘potentially provide a better quality of news information through visual documentation.13. How much better becomes evident when comparing the BBC footages with a publication on the conflict by the New York Times on 16 January. The reporters describe the main terminal of Donetsk Airport as ‘a battered and booby-trapped wreck’. An accompanying picture shows smoke rising from the airport ruins in the distance14. The BBC reporters got closer to the frontline than The New York Times photographer, and they had the visual evidence of the devastation. But sending a war reporter with a drone to the frontline means taking a huge risk. If a BBC reporter recorded the footage on 18 January (They did not attribute their footage to the Army SOS, so it must be their own) the battle of the airport was in full swing. The first 34 seconds of the BBC ‘drone footage’ video is recorded with the drone. The last 20 seconds of the video is recorded with a handheld camera. 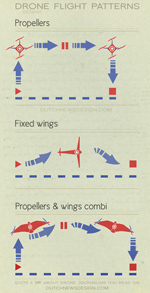 There is no set noise of the drone propellers (as in the first part), and the dissimilarity in the camera’s depth of field suggests the use of a different camera. The complete 55 seconds video suggest that the BBC drone journalist was embedded with the Ukraine army during the fight: as in the second part several shots are fired. In The Robot Eye Witness, Astrid Gynnild argues that drone journalism is ‘reducing human risk taking when covering catastrophic and conflicting events’15. Corcoran remarks that there are applications ‘where the lone drone could be extremely beneficial to the safety of news gatherers in the field’16. The drone can, for example, be used to scout the area, to see if its safe for a journalist to go somewhere. Or a drone can be operated at a great distance from a risky area – a few kilometres from Donetsk Airport. Yet the BBC reporter at peril – the soldiers are shooting. The drone seems not the be used to substitute risky war reporting operations, but to match the competition, to obtain their own drone report. 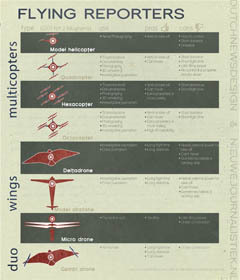 Drone war reporting: gamification of the news? Journalists seduced by the thrill of flight and audiences downloading footage on their computers may experience a psychological disconnect between entertainment and news. Both may gain a drone’s eye-view of battlefields and disaster zones, but they may lose the tactile details that humanise news coverage17. That scenario might be an attractive alternative for “hotel journalists” as war correspondent Robert Fisk described them viciously in his personal blog18. War reporters clustered in hotels, not able or willing to go outside, and reporting the news from their rooms. These journalists might be interested in launching a drone from the hotel roof and operate the device from inside their rooms, flying through sniper alley without any risk. And exciting footage will no doubt go viral. However, for an audience that demands multiple views on a story19, the drone footage is just a storytelling element, not the full story. Gibbs conclusion is nevertheless understandable, as in her research the history of drone journalism is strongly rooted in the military use of drones. She refers to the book Predator: The remote-control air war over Iraq and Afghanistan: A pilot’s story, in which former drone pilot Matt Martin describes how his work ‘gamified’ the war20. This analogy is adequate between on the one side gamers watching a computer screen and shooting virtual enemies in games like Call of Duty and Halo, and on the other side the drone pilot watching a computer screen and shooting real people. The comparison is far less satisfactory when it comes to news gathering reporters, shooting nothing but images. Goldberg, Corcoran, and Picard(2013), emphasise that audiences are accustomed to versatile storytelling21. They expect multiple viewpoints22. In the BBC feature article that is how the drone footage is used. It provides the audience with extra context, along with maps, infographics, photos and text23. This indicates that drone war reporting has a supplemental function. A 3D model of a news event, used in reporting, has the same supplemental capability. Drone footage can however potentially add drama to the audience experience. 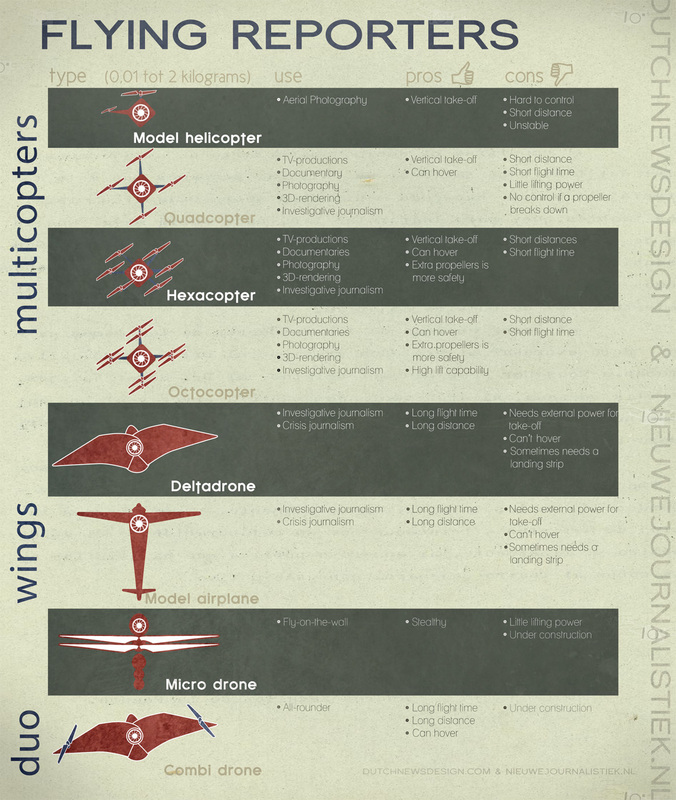 And not just because many online drone video reports are accompanied by epic soundtracks24. The camera motion itself adds a cinematographic experience. Since I am Cuba (1964) by Mikhail Kalatozov the flowing aerial shot is a popular camera motion in movies25. The bird’s perspective seems to give viewers the sense that the filmed scene is part of something bigger, it gives a sense of freedom. The camera is not as far away as a helicopter but not as close to the subject as a shoulder camera26. As a consequence, the spectator isn’t made part of the scene below and can continue the flying motion without being affected by the occurrences on the ground. If drone journalists want to be correct reporters, they have to do more than restrain from the use of soundtracks. They have to be aware of the cinematographic effect of the footage. In 2006, the same year war reporter Corcoran had his drone Eureka moment, Tumber and Webster published their report Journalists under fire. They concluded that in covering the ’theather of war’ the use of ‘virtuoso technologies to deliver astonishing pictures and sound to audiences in distance places will add drama to the news’27. For future war reporters equipped with a drone and other wearables for maximum multimedia storytelling, this is a noteworthy remark. Gibb, A.S. 2013. Droning the story. University of British Columbia (doctoral dissertation); Haddou, L. 2014. Journalism gets into the act as drones capture floods, protests and wars. Media Blog The Guardian. February 2014. BBC. 2015a. Ukrain Conflict: Battle rages in Donetsk and Luhansk. January 2015. Vice. 2015. Drone Footage Shows Ukraine’s Donetsk Airport in Ruins After Months of Fighting. 17 January 2015. Specia, M. 2015. Drone video shows scale of destruction at Donetsk airport. Mashable. 16 January 2015. BBC. 2015a. Ukraine Conflict: Battle rages in Donetsk and Luhansk. January 2015. Tumber, H. & Webster, F. (2006). Journalists under fire: Information war and journalistic practices. Sage.